I experienced something extraordinary last week. I was Composer in Residence for the first ever Big Sky Conservatory Choral Initiative, hosted in Big Sky, Montana by the Philadelphia-based chamber choir The Crossing. I first fell in love with The Crossing four years ago when they commissioned According to Seneca from me. They are a remarkable group of professional singers, performing only new music with a commitment, artistry and virtuosity that are quite stunning (perhaps, in part, because they want to do it, not because they have to). Under the inspired direction of Donald Nally, they have, for the last ten years, created performances of spellbinding communicative power, with an innovative and holistic approach to programming, and have introduced a whole host of fantastic composers to the Philadelphia area and beyond. They are, also, some of the loveliest people I know. 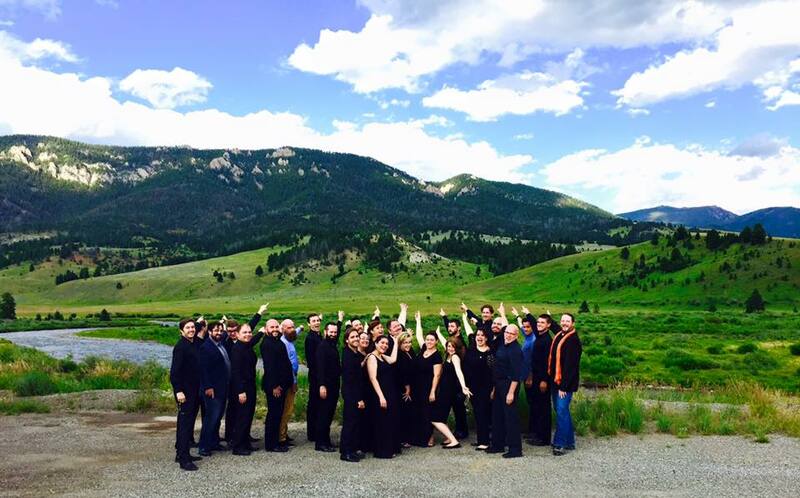 So there we were, gathered high up in the mountains of Montana, with breathtaking views all around us – twelve singers from The Crossing, eight singing students, four composers, the indefatigable accompanist John Grecia, Donald Nally and myself. The aim? For the young singers to explore a whole host of new repertoire, for the composers to experiment, to refine, to rewrite (if needed) their pieces so as to best realise their intentions, and to introduce contemporary choral music to the Big Sky community. At the heart of the week, of course, was brand-new music. Our four very different composers produced four very different pieces: John Conahan‘s Mantra of the Humane used just two lines of text and small amounts of musical material to create a meditative, subtly-changing soundscape; in High flight, Ed Frazier Davis matched the ecstatic, free-wheeling quality of John Gillespie Magee’s celebrated poem with music of comparable ecstasy, richness and complexity; James Lavino brought an alternate dark, pulsing intensity and a troubled radiance (with a luminous ending) to his setting of Tinsel by the Scot, Robin Robertson; and Michael Robert Smith set Walt Whitman’s Reconciliation to relatively simple, elegantly-turned, beautifully vocal music with a compelling through-line from start to finish. At the end of the week there was a concert of the fruits of our labours: some Crossing favourites – music by Ted Hearne, Pelle Gudmunsen-Holmgreen and Kile Smith, premieres of the four composing fellows’ brand-new pieces, and a blistering performance of According to Seneca. I doubt the audience of Big Sky locals had heard of any of us, let alone heard any of our music, but they responded with warmth and great enthusiasm to everything. Which only goes to show that if you present difficult contemporary music with conviction, love and integrity, it will resonate with open-minded listeners everywhere. I – we all, I think – experienced something extraordinary last week.